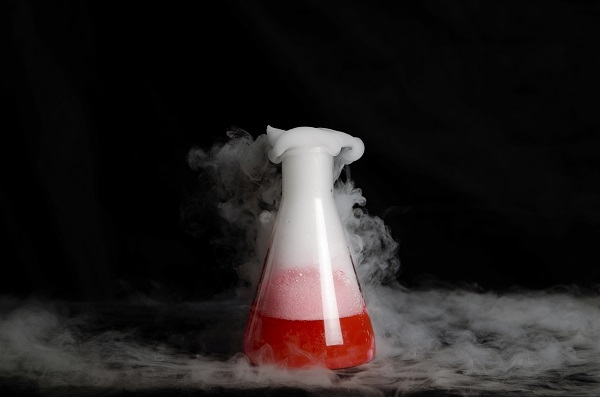 Thanks to this incredibly low temperature and its many unique attributes dry ice can be used in a multitude of ways – including as a useful tool for creating engaging lesson plans for students of all ages. When carbon monoxide is frozen, it reaches incredibly low temperatures (-109.3ºF) and becomes a substance known as dry ice. Thanks to this incredibly low temperature and its many unique attributes it can be used in a multitude of ways – including as a useful tool for creating engaging lesson plans for students of all ages. Using a hidden bottle of hot water, you can create a dramatic smoking volcano effect with the help of dry ice. Depending on age level and supervision, the closer to boiling the water can be for a stronger effect. To create the effect, you will simply drop small pieces of dry ice into the container of hot water inside the volcano to create an eruption of steam. If you’re learning about how clouds work, dry ice can be used to help emphasize and observe the way alpha and beta particles work. Cover the inside of a clear, freezer safe dish, such as pyrex, with black felt or paper. Apply alcohol to one side of a piece of cardboard cut to be just bigger than the top of the dish. The cardboard should be placed, wet side down, over the dish and then the top can be heated with a hand or an iron on a low setting. Finally, put the bowl on top of a slab of dry ice. The temperature differences will cause the alcohol to form a cloud with vapor trails that can be seen when illuminated. Using different types of light sources will make sections more or less visible. Every year hundreds of thousands of tons of baking soda are produced to be used in many different processes including baking and cleaning. You can make your own baking soda in the school lab by carefully mixing dry ice with ammonium carbonate, vinegar, and salt. Make your own miniature comet to teach students about space! You’ll need about three pounds of dry ice, small plastic bags and a garbage bag, a large bowl, a hammer, gloves, sand, a few drops of ammonia, and water. Use the garbage bag to line your bowl and place about two cups of water, the ammonia, and a few spoonfuls of sand in the bottom. Wearing gloves and with supervision, place your dry ice in layered plastic bags and crush it with the hammer. When you have two cups of crushed dry ice, add the crumbles to your water and stir it until the ice freezes together, using the liner to lift it out of the bowl and form it into a ball. When unwrapped you can set the ball onto a safe surface and watch it fizz out. This entry was posted on Friday, March 1st, 2019	at 11:50 AM	and is filed under Many Uses of Dry Ice	. You can follow any responses to this entry through the RSS 2.0	feed. Both comments and pings are currently closed.